It’s the ultimate Pi Day! As you may or may not know March 14th (3.14) is Pi Day, but this year is extra special because it is 2015 which makes it 3.14.15 = 3.1415. Last year I made some pie pops which were tasty and cute but this year I fused two of my favorite things… pies and doughnuts. 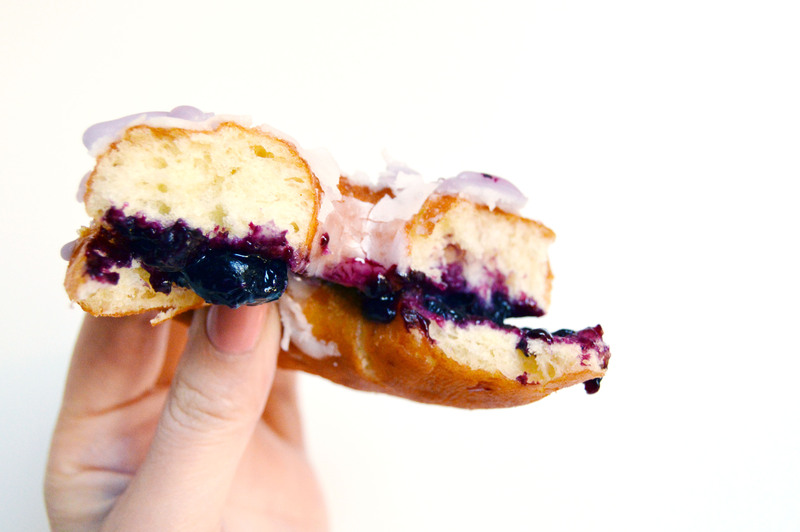 This blueberry pie doughnut is a light yeasted doughnut filled with blueberry filling and topped with a vanilla and blueberry glaze. I won’t lie, the recipe takes time and it’s a messy process, but definitely worth it. A word of warning, putting the blueberry glaze is the messiest part. The glaze sets quickly so it is similar to working with hot candle wax. Just go Jackson Pollock on it and have fun. As for the mess you make, some things are just worth the extra effort. In a small bowl, combine milk and shortening and heat until shortening melts. In a separate bowl, stir water, 1 tbsp sugar and yeast together until yeast is incorporated. In the bowl of a standing mixer, mix eggs, 3 tbsp. sugar, salt, nutmeg and flour until combined. Once yeast is proofed, add the milk and yeast mixture to the flour mixture and mix in the standing mixer with the dough hook attachment until combined. Let the dough rest for 8 minutes. With the mixer on medium-low speed, knead dough until dough is smooth and pulls away from the bowl, about 6-8 minutes. Transfer dough to an oiled bowl, cover and let rise for 1 hour or doubled in size. On a floured surface, roll out dough to ¼ in. thick and cut dough using a 2 ¾ inch round pastry ring and 1 inch round pastry ring for the center of the doughnut. Set punched out dough onto a baking sheet and cover and let rise for 30 minutes. Preheat oil in a pot to 365˚F and cook for 1 minute per side. Transfer to a cooling rack and let cool before glazing. Cut cooled doughnuts in half using a bread knife. Dip top half of the doughnut in the vanilla glaze, and generously cover the bottom half of the doughnut with blueberry filling. 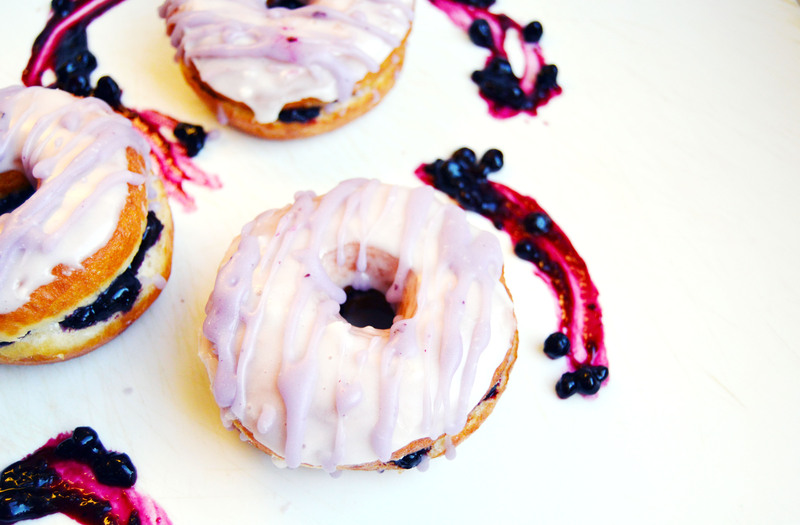 Assemble the doughnut and splatter blueberry glaze over the top. In a small pot, combine 2 cups of blueberries with ⅓ cup of sugar. Bring to a boil and reduce to a simmer until all the berries burst and sugar is completely melted; about 5 minutes. The mixture should look very liquid. In a small bowl, mix cornstarch and water until it becomes a slurry. Add to the blueberry mixture and cook until it becomes thick. It will become almost paste-like. Transfer blueberry mix to a bowl and rest of the blueberries and lemon juice. Add more lemon juice if needed. In a saucier, heat milk until it simmers. Slowly add sugar, whisking in one cup at a time. Slowly whisk in powdered sugar. This entry was posted in blueberry, Bread, Desserts, Holidays, Yeast Breads and tagged blueberries, blueberry, dessert, doughnut, pi day. Bookmark the permalink. I’m currently baking a pie and I type this but I am so enamored with these pie-doughnuts! Thank you ❤️❤️❤️ I hope you enjoyed Pi Day! Thank you! ❤ Blueberries are the best, aren't they?